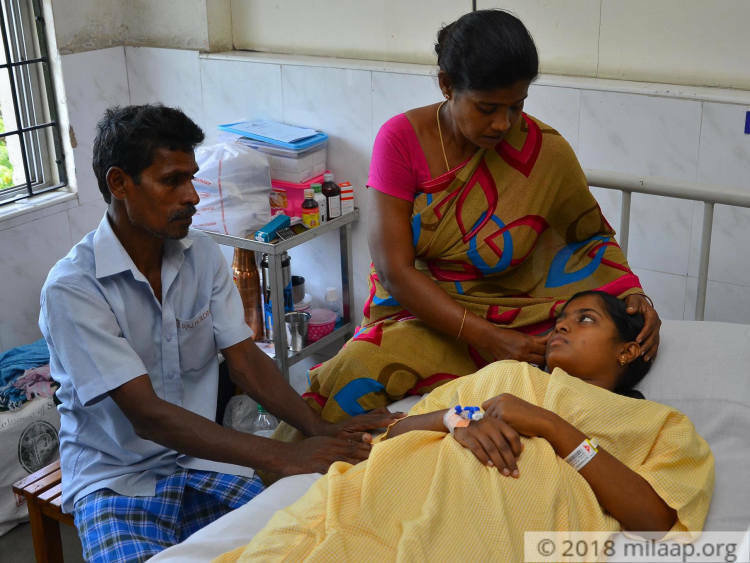 “The day she got the admission card to study BSC Chemistry from college, she was admitted to the hospital. We believed that she'll be discharged soon but the reports confirmed that she has cancer. I have no job now, her father cannot walk on his own. We are struggling to save our daughter”,Rama, Mother of Narmadha. 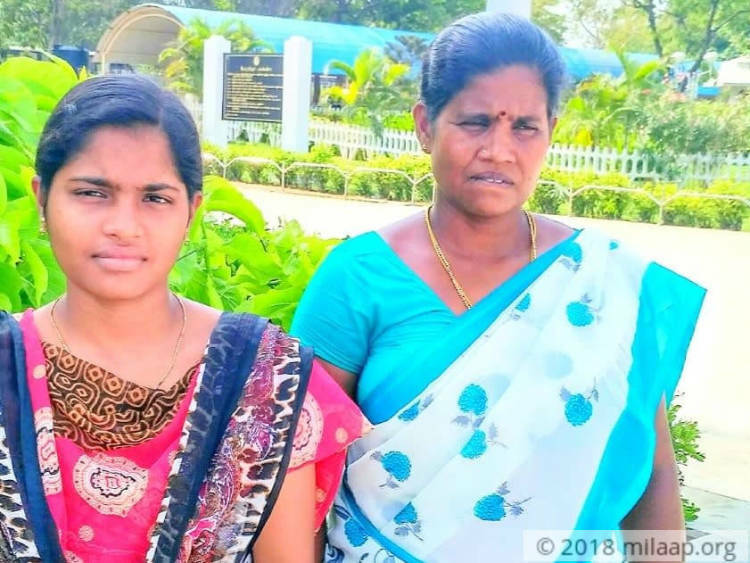 17-year-old Narmadha is the first person in her family to go to college. All her dreams came crashing down because of cancer. She begs the doctors to let her attend classes. She wants to survive cancer but her poor parents are unable to afford the treatment. Narmadha recently passed 12th grade with 1070 marks, and even secured admission for BSc Chemistry. Her parents were hopeful about her future. Little did they know that their lives would come to a standstill with the diagnosis of Acute Myeloid Leukemia, a cancer in the bone marrow and it quickly moves to blood. It can spread to other parts of the body like lymph nodes, liver, spleen and central nervous system. "When the first time she underwent chemo, she couldn't bear the pain. She was continuously throwing up. She can't bear that she has missed the opportunity to join the college. She needs chemo every week for the next 6 months. 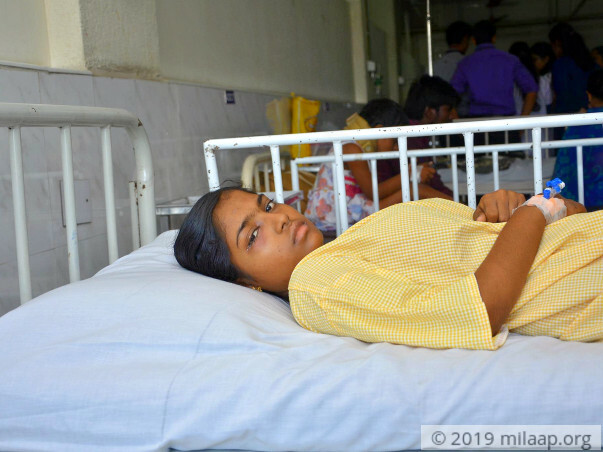 She begged the doctors to allow her to attend classes for the rest of the days but now she is too tired that she can't even get up from her bed. She has stopped asking and she cries in silence day and night." Narmadha's mother Rama never had an easy life. She has been struggling all alone for years to support her family. 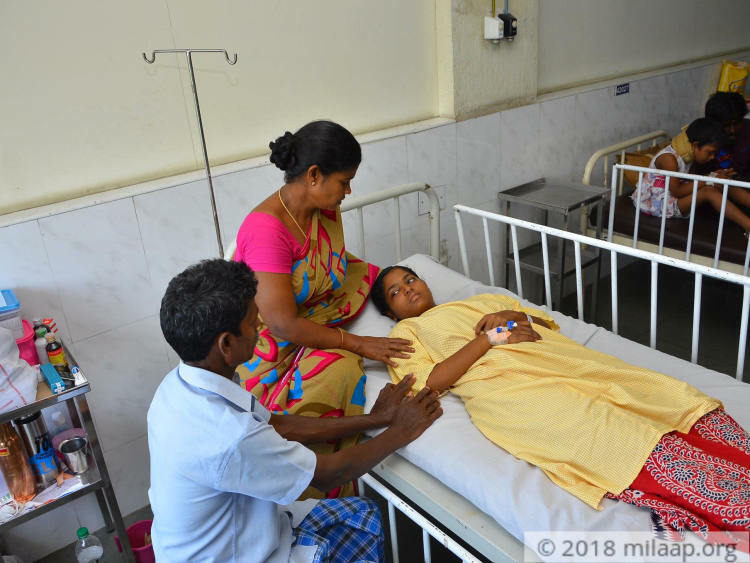 Her father Muthu got a swelling in his legs years back and it was found to be a tumor. He was not able to walk after it was operated. Despite the poverty, she made sure both her children Narmadha and Naraen (14) are provided with all the basic needs. 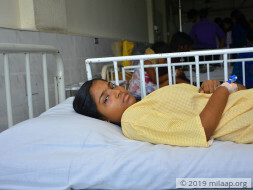 Now she stays with Narmadha in the hospital to take care of her. Father feels helpless about the whole situation and he hardly eats. "With whatever little money I have, I buy her fruits and vegetables. People here told me dry fruits are good for health and I even got that for her. We have never been able to afford all that but I'm doing all that is possible to save her. But nothing is helping her. She says she feels hungry all the time but she is not able to eat anything. She throws up immediately. She has a painful journey ahead. I dread the thought of her hair falling down completely and other changes in her body that happen with chemo. I can't bear to see her suffering." - Rama, Mother. Rama who was working as a daily wager is now unable to go for work. She was earning Rs 150 per day. She managed to save every rupee for her children. Her earnings were just enough to feed the family, sometimes they even skip meals. She never had any savings. Even for the initial scans, she had to borrow money from her relatives. Now she is left with nothing to continue the treatment. "She could see that we are borrowing money even for our food and she's deeply hurt by it. One day, she apologized to us for being a burden. We were completely shattered. As a father, I'm failing her. I have never been able to do anything for her. I have not even bought her good food but now I'm not able to save her life also. I wish God had chosen me for this cruelty. My daughter deserves a life. She has a lot of dreams about her future, which may not be realized if we cannot save her." - Muthu Krishnan. 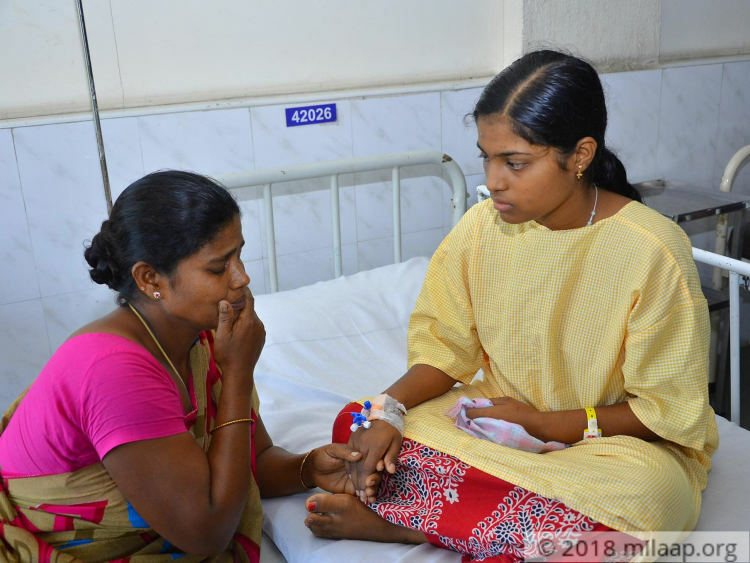 17-year-old Narmadha suffers from dreadful cancer and it has shattered all her dreams of becoming the first graduate in her family. 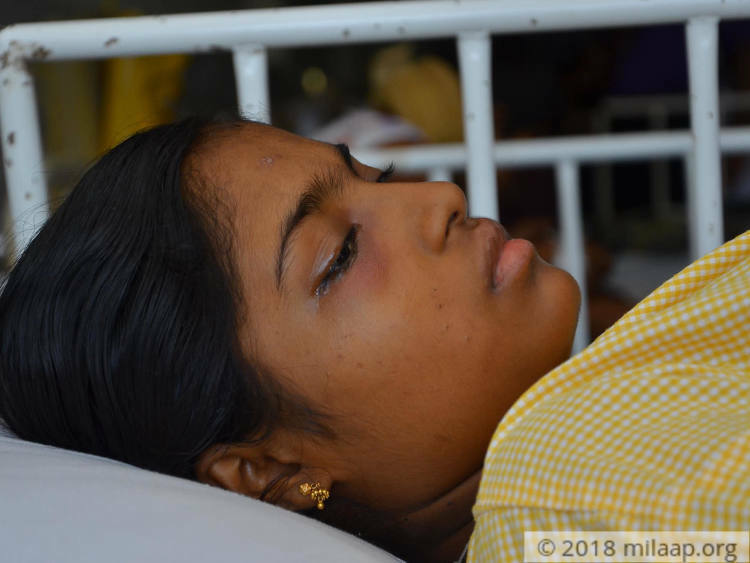 Her father is physically challenged and her mother who was a daily wager worker has stopped working to take care of her. They have nothing in their hands to save her life. They have been borrowing money even for their next meal. 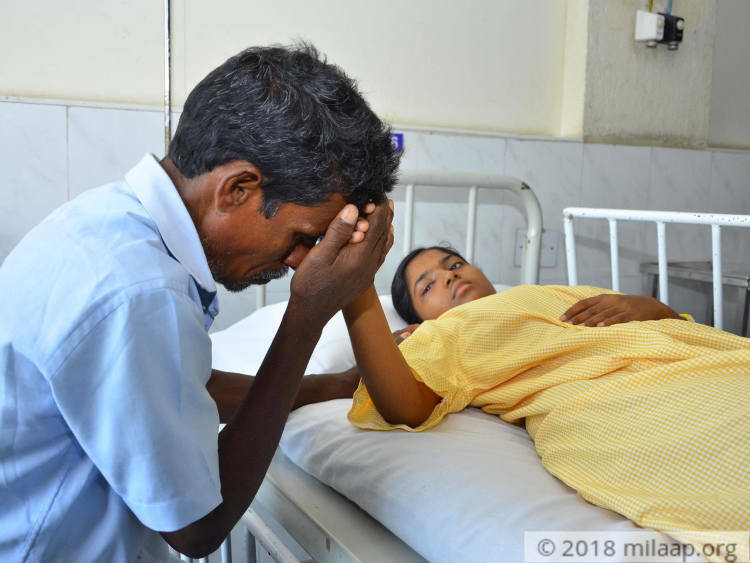 Narmadha needs treatment for the next 6 months and it costs Rs 12 lakh which is beyond their means. Only your support can save their lives. The specifics of this case have been verified by the medical team at the concerned hospital. For any clarification on the treatment or associated costs, contact the campaign organizer or the medical team. Thank you for all the love and support given to me. I am presently in the hospital undergoing my last cycle of chemotherapy after which my treatment will be completed. I have to visit the hospital for regular check-ups later on. Here's a quick update on Narmadha's health. She has finished 3 cycles and is waiting for last one more cycle. Her disease is under control and she is very well. Thank you for the love and support you have shown towards Narmadha. 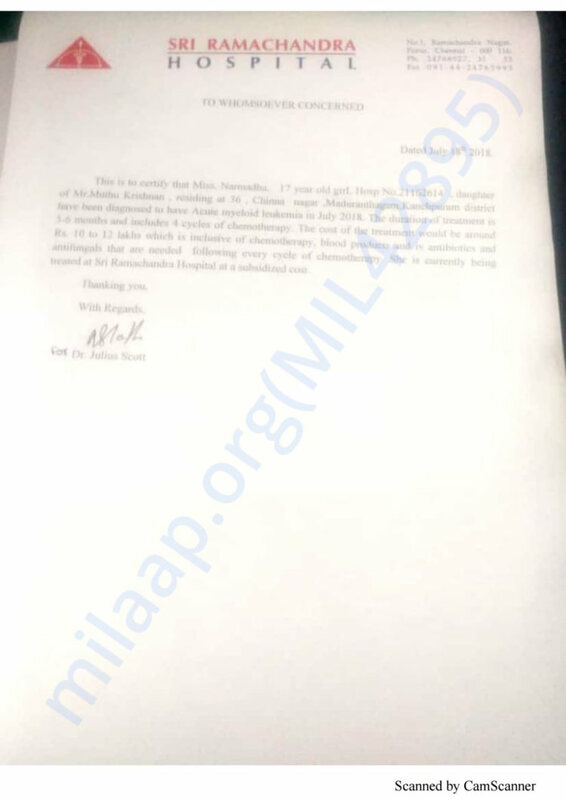 Narmadha has to undergo chemotherapy in the teaching hospital. She needs urgent funds to undergo the treatment. Please share this campaign as much as possible so that the chemotherapy can be initiated at the earliest.